HomeEducationTen Students Sign Up for the New GA CATT Apprenticeship Training Program. 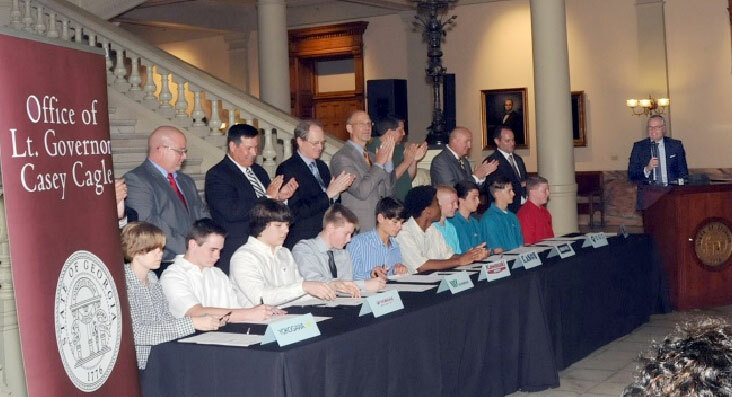 Ten Students Sign Up for the New GA CATT Apprenticeship Training Program. Everything old was new again, or so it seemed at the Georgia Capitol on Tuesday, as the inaugural class of the Georgia Consortium for Advanced Technical Training (GA CATT) Program signed apprenticeship agreements that will allow them to graduate from high school with a diploma, an associate degree in Industrial Mechanics via West Georgia Technical College, and a German apprenticeship certificate. The ten rising high school sophomores will work as paid apprentices for three years at one of eight Coweta County companies, including Grenzebach, E.G.O. North America, Yamaha, Kason, Yokogawa, Winpak, KCMA and Groov-Pin. Lt. Governor Casey Cagle, who hosted the signing ceremony, praised the plan as a key tool in the state’s workforce development program. Today we celebrate the promise of new beginnings in Georgia’s public education system through the innovative program known as GA CATT. These students and manufacturers are committed to the kind of workforce development that will revolutionize Georgia’s economy. This ceremony was more than symbolic – it signals a brighter future for our students who want to pursue meaningful careers well ahead of the traditional education timeline. This program has the ability to reshape our perception of the role of public education as we chart a new course in how to better prepare our students for life after graduation. While the Coweta County program is the first to get off the ground, Cagle is working with college and career academies, school districts, and industry leaders to create similar partnerships around the state. Acronyms must be cleared through a governmental agency, maybe NIH.gov or maybe some IP Commission. There is a nominal fee to offset the multimillion $ staff budget. Job openings: GA Tech or GSU MBA’s preferred.